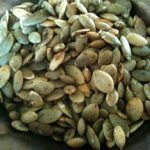 Put pumpkin seeds, pepper, cumin, chili powder, and salt in a medium bowl and toss to combine. Add lime juice and toss again until spice mixture is evenly distributed among the seeds. Line baking sheet with parchment paper. Spread seeds on pan and bake for about 9 minutes, shaking the pan every 3 minutes or so. You want the seeds lightly browned and dry.